21 April 2015 – Battambang Master Plan Team shared experiences on Heritage Conservation in Battambang Municipality to Vietnamese Team. 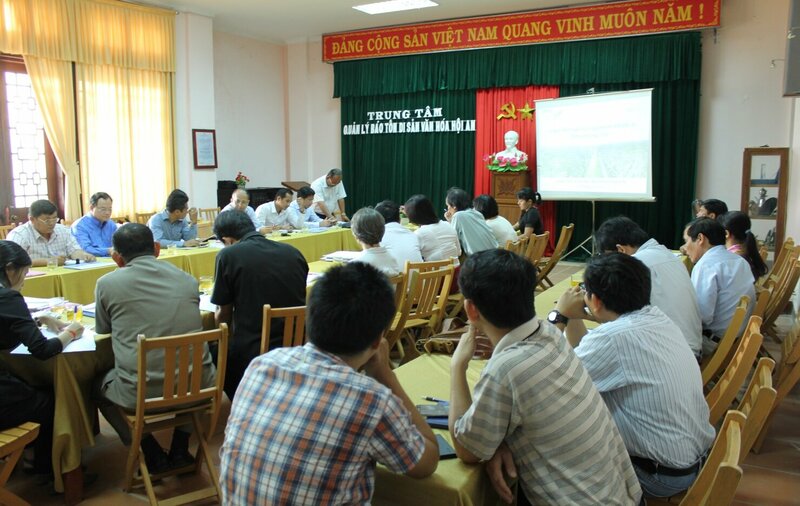 A study trip on heritage conservation had been conducted to Hoi An city, Quang Nam Province, Vietnam in partnership between Ministry of Land Management, Urban Planning and Construction and GIZ. 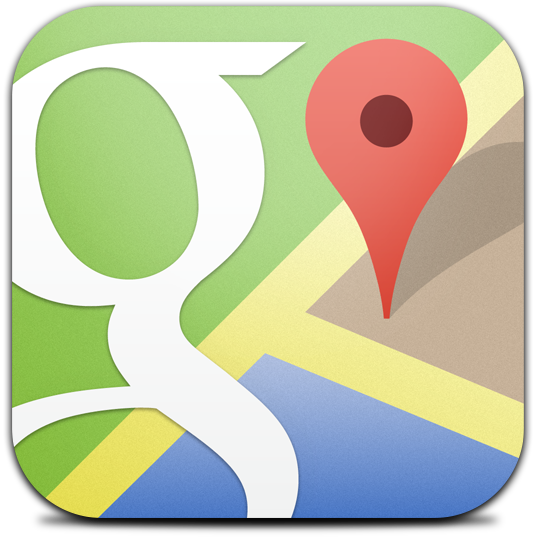 The study trip was from April 20 – 23, 2015. Totally there were 19 people from National and Sub-National levels including Battambang, Kampong Chhnang, Takeo and Kandal provinces within the GIZ support to the Land Management Sub-Sector Program. The study visit served to exchange the knowledge and experiences on preserving heritage and on urban planning and management, particularly between Battambang Municipality and Hoi An city. 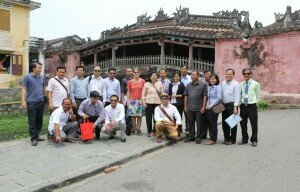 It is to learn from Hoi An experience on the preparation of the registration for UNESCO Heritage List. In 1999, Hoi An successfully entered into the UNESCO heritage list. Meanwhile, Battambang has undergone various steps to preserving its built heritage and has been discussed as a potential candidate for the UNESCO Heritage City list. The Cambodian delegation had a meeting with the Hoi An Center for Monuments Management and Preservation, and the Department of Urban Management. Mr. Nguyen Chi Trung, Director of the center expressed his warm welcome to the delegation. The discussion was focusing on the heritage management, tourism and urban planning. The Cambodian delegation explored and learned about the way towards becoming an UNESCO World Heritage Site, how to manage this after successful registration, as well as balancing between conservation and development. Additionally, Mr. Tran Van An, Deputy Director of the center, shared his insight and valuable recommendations of how Battambang should focus on during the document preparation process before submitting to the UNESCO. Besides, the Battambang Municipal Master Plan Team had also shared their experiences in the effort of preserving historical buildings and ancient houses to the Vietnamese team. 22 April 2015 – Cambodian delegation visited Hoi An Ancient Town to understand about the implementation of house restoration regulation and arrangement for tourism development. explored how the local community engaged and participated with public sector in house restoration, and the implementation of the policies and regulations. The discussion demonstrated that local community participation is recognized to play a significant role in heritage conservation. The good coordination between relevant stakeholders both in public and private sector since the beginning is crucial for a smooth process. Various meetings, workshops, seminars, dialogues, symposiums shall be conducted to raise public awareness on the value of heritage buildings and to promote active participation. During the two-day event, the delegation also had the opportunity to observe how the restored ancient town looks like and organized a visit, showcasing influence of the implementation of the various government policies in accordance with the UNESCO guideline. The delegation was impressed how the policies were successfully implemented on the ground in a harmonized way with local people’s daily life. From the study trip, the delegation team also learned that challenges still lay ahead – before, during and after the successful registration – which need to be taken into consideration. Experiences from Vietnam can’t be totally replicated in Cambodia due to the differences in political, social, economic, cultural and traditional contexts. The delegation team, therefore, also recommended that further exchange of experiences will be required to establish guidelines and regulations on urban heritage conservation and to be successfully register for the UNESCO World Heritage Site.